Last night I attended a private event by Jennifer Muller/The Works at their loft studio in Chelsea. It was a lovely evening--I reconnected with a dance peer I hadn't seen since my undergrad days--and chowed down on some yummy sushi, cheese and fruit. The company showed 5 excerpts from past works, including a sneak peak of a work-in-progress that will premiere at their gala in June. Of note was the highlight from Edge (2007). Muller's use of Zap Mama music successfully showcased her signature emotive movement. 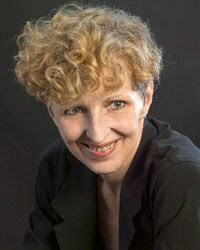 The powerful polyphonic rhythms sung by Marie Daulne isolated the well-crafted solos, duets and trios. In the Q&A with Muller and the dancers following the 45 minute program, executive director John Louis Bryant announced that the Muller Technique is featured in a new German book presented by Tanztechnik that compares 7 different contemporary dance techniques. Muller calls her technique a "polarity technique" that "contrasts a relaxed and grounded plié with an extenuated and energized up.” I'm now desperate to get my hands on that book, as literature on dance technique is few and far between. I have to say that Muller's dancers are beautiful, but I'm not sure a technique informed by "groundedness" really translates into the body. It's no secret that I prefer Klein technique, because it's informed by human anatomical structure in order to achieve "groundedness." But to be fair, I should take a Muller class and pass judgement then. Also, one audience member asked if there's a difference between modern and contemporary dance (Muller favors contemporary). I thought that was a great question, especially after living in London where it's only called "contemporary dance," yet when I was studying dance in high school and college in the US, it was definitely "modern dance." I think that would make for an interesting debate and future blog post! 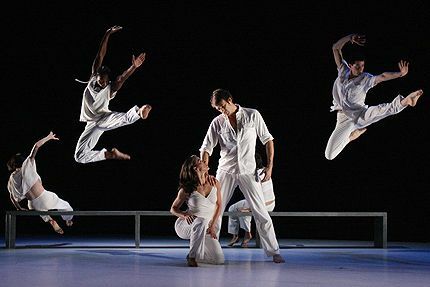 You can catch the world premiere of Muller's new evening-length piece, The White Room, at the Cedar Lake Theater--547 W. 26th Street--from June 22 - 26, 2011. Tickets are $49 and will be available beginning April 1 at 212-868-4444 or www.smarttix.com. Gala tickets are available at (212) 691-3803. A Gala Dinner and Silent Auction at Chelsea Art Museum, 556 W. 22nd Street, NYC, will follow the Opening Night Gala performance. The Gala honors Phoenix Partners Group, lead corporate sponsor for the company's education programs. The White Room begins in a large featureless space, which alters as the piece progresses, influenced by the attitudes and actions of those inhabiting it. In the beginning, the room echoes the innocence of a young girl; The White Room is her story. She is both damaged and transformed by encounters with a diverse cast of characters. The piece concerns the corruption of innocence, contrasting purity with heartless self-interest and questioning the value systems of our times. The music is a compilation of cello-based music from traditional sources including Yo-Yo Ma and contemporary composers Zoe Keating, Break of Reality, Gordon Withers, Matthew Schoening and Julia Kent. Costume and stage design by Stageworks, lighting design by Jeff Croiter and projection design by Kevin Harkins.